I am so excited to be sharing this gorgeous new collection from BLUSH Lacquers for Spring 2019. 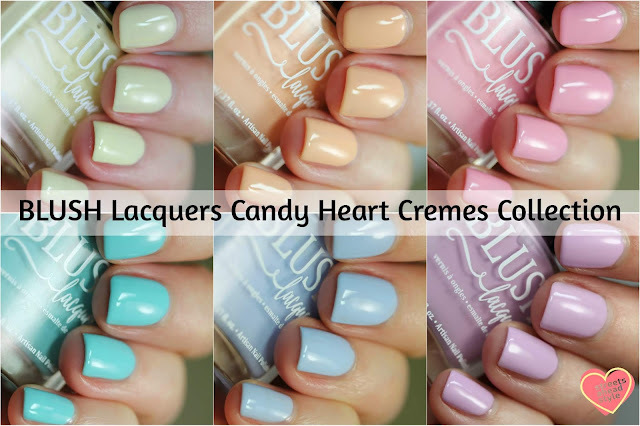 The BLUSH Lacquers Candy Heart Cremes Collection is a set of six creamy pastel shades inspired by everyone's favorite conversation heart candies. These versatile cremes can be worn alone for a timeless and simple look or worn as a base color for our coordinating Double Rainbow Shimmers Collection (look for my review of that Collection on the blog in the next day or so!). The Candy Heart Cremes areopaque in 2-3 coats when worn alone. Pastel cremes are some of my favorite kinds of creme polishes and I absolutely love the BLUSH formula so this Collection stole my heart. It didn't even have to try but it did and it's a fantastic set of cremes that I can see many of you loving. BLUSH Lacquers Angel is a pastel banana yellow creme. Photos show three thin coats plus top coat; this was the only polish that gave me some issues. I had to use four coats on some nails to get rid of the dark spots and it seemed to take longer than the others to dry. BLUSH Lacquers As If is a pastel creamsicle-peach creme. Such a cute orange - it has me craving a creamsicle for sure! Three thin coats plus top coat; the formula is quick-drying so it makes for a very easy application. Ditto for the rest of the polishes in the collection! BLUSH Lacquers Be Mine is a pastel bubblegum pink creme. I love this one so much! It's my perfect bubblegum pink. BLUSH Lacquers Kiss Me is a pastel lilac creme. I really like how this is perfect warm lilac. BLUSH Lacquers True Love is a pastel blue creme. I've never seen such a perfect pastel blue! It's a little bit cornflower and a lot of love. BLUSH Lacquers You & Me is a pastel turquoise creme. This one is probably the brightest of the pastels and it's absolutely lovely! The price for each polish will be $7.00 USD or $42.00 USD for the full set and if you purchase the full collection. 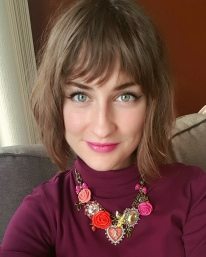 The BLUSH Lacquers Candy Heart Cremes Collection will debuting in-person at Polish Con New Orleans on Saturday April 6, 2019. The collection will be available online at blushlacquers.com on Friday April 12, 2019 at 7 PM EST.